One more vegetable added to my list of never-liked-before but I like it now veggies list.I've not been very fond of Brinjal based dishes mainly because of the texture the vegetable provides--soggy and slimy and many more such unprintable words! !I started getting interested in Brinjal only after I found out that it tastes very much similar to Gulla/Matti Gulla and I could use it for any preparation as a substitute for the same.Since this one is one of our favorites,Brinjals invariably make their way into our fridge. I initially wanted to prepare the famous Ennai Kathrikai as I have heard so many rave reviews about it.But I did not want to be over enthusiastic.Now here I was with a vegetable I barely noticed before and the next instant I decide to cook one of the best-ever Brinjal preparations? ?I wanted to take the easier route and I did!! Nags has many Brinjal recipes in her blog and it wasn't hard for me to choose a recipe.I chose the different yet delicious looking Brinjals in tomato ketchup.We had it with Rotis and surprisingly,finished off the whole bowl!! Thank you Nags,let me try your Ennai Kathrikai..someday!! Slice the brinjal and add the pieces to a bowl of water to prevent browning. Set aside. Heat oil and add the mustard seeds. Once they pop, add the chopped onion and garlic. Fry until golden brown. Add the masala - turmeric, coriander, chilly, curry leaves if using - and fry for another minute. Now add the brinjal pieces, reduce flame to low and mix well. Cook covered for 5 minutes, stirring once or twice in the middle to prevent the vegetable sticking to the pan. Once the brinjal is cooked almost mushy, add the ketchup or sauce and mix well. Add salt. You made the humble brinjal a tempting veggie. Must try it out. 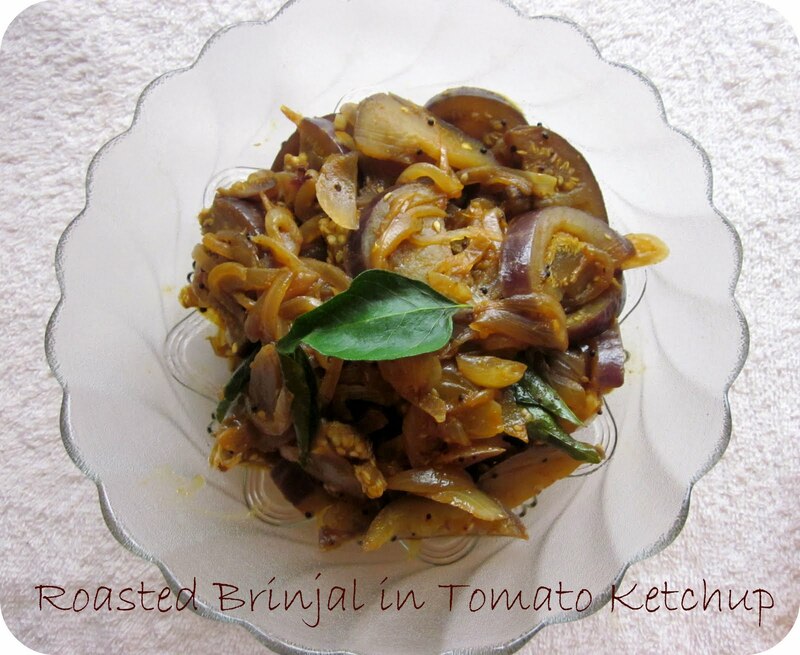 This roasted brinjal dish sounds very interesting and delicous..thanks for sharing..
but I always loved brinjal and cant eat enough of this. looks so tempting and that too seems quick. love this Divya gonna make them soon. Wow! Divya...this is such a yummy recipe..
lovely and delicious and inviting dish. eggplant is hubby's most fav veggie.. this looks interesting . will definitely try it.. The brinjal dish looks good. thank u so much to both u and nags ! Loved it..
Banana Halwa ~ For someone special ! !